Do you have a problem with shoes? Many women do. High heels are all the rage but, sadly, my days of wearing hot hoochie shoes are long gone. Even if they fit properly, I’d break my leg before the second step! Big fat feet can be a problem. I have pretty straight size 9 medium feet. I can hear you now, “Those are NOT big fat feet!” Well, they are 3-5 months out of the year because my size 9 mediums swell in the summer. Horribly. Balloons. Can we spell G-O-O-D-Y-E-A-R B-L-I-M-P, boys and girls? This has been going on since I was 9 years old and I’ve never quite gotten used to it. I have to keep a couple of pairs of wide or wide-wide summer shoes for when the feet get huge. Barefoot doesn’t work for everything. Would you be amazed if I told you many of my size 4 friends have wide feet? It’s really not totally related to weight. Did you know that women’s feet grow and shrink with weight loss, childbirth and age? They do. Maybe you didn’t always have big fat or wide feet. Here’s a few ways they can change. If you gain weight, you may need bigger shoes. I’ve been told by more than a few doctors that if you gain significant weight, you develop fat pads on the bottoms of your feet, on the sides of your feet and even in your toes. Conversely, if you lose a lot of weight your shoe size may decrease. Childbirth causes many changes, including foot size. Sometimes, your feet shrink back and sometimes they don’t. Aging can sometimes give you bigger feet, too. So if you were a size 7 in high school, there’s a good chance that life grabbed you by the big toe and you are no longer a size 7 now. Let’s face it, all women want cute shoes, even those of us with big fat feet. When I was a young woman, wide shoes were definitely not cute. Now? You have a gazillion choices. And, yes, even hot hoochie heels if you can wear them! The choices are really endless and they are readily available in most places. Brannock Device. This is the most accurate way to get your correct foot size. In a moment, I’m going to give you a whole bunch of links where you can get really cute shoes in many sizes and widths. But before you order, do you know your accurate shoe size? Don’t laugh. Experts claim that many women actually don’t know their correct shoe size or, if they do, they stuff their feet into smaller shoes. Oh, the pain! Find a Brannock device (see pic), you know, that thing you stick your feet in and move the top and side sliders until it fits your foot? Make sure your foot is not squeezed and you leave yourself some toe room. 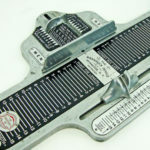 Have a shoe professional measure you, if possible. Nobody sees the size of your shoes so even if it’s a number you don’t like, who’s gonna notice? Now that you know the correct size, let’s go shopping! One of the very best places to get wide and/or large shoes is Woman Within. You can also get the shoes at Roamans or Jessica London (same parent company). They have it all. Cute sandals, high heels, pumps, gym shoes, you name it. And most of it comes in sizes 7 through 12, Medium, Wide and Wide-Wide. Check the item description of each pair to make sure the shoes you want come in your size. They also have their own brand called Comfortview. I’ve owned many. The comfort is real. Remember me telling you about Simply Be and JD Williams a few weeks back? They have lots of cute shoes, too, and most of them come in wide width. Some come in extra wide. When you shop from the USA websites, the sizes have been converted from the British. Just this past Friday, we talked about Torrid. They have really, really, REALLY cute shoes, but in wide width only. And for those of you with Barney Rubble feet, they come in sizes 6 and 6.5 WIDE, very difficult to find in most places. Here are a few more places to look. As always, check out the item description carefully for each item you’re interested in. Many large retailers get their shoes from different manufacturers. Look for notes that say something like, “Runs small. Order up a half-size.” (Or a whole size!) And read the reviews from folks who have already purchased the shoes. That’s where you find the real scoop. Amazon has everything, including shoes. . . tons and tons of shoes. Limited styles but nice shoes available from Lane Bryant and Catherines. QVC has many name brands in wide widths. Same for Home Shopping Network. And don’t forget the monstrous online shoe store Zappos. If you are a shoe diva with big fat feet, you no longer have to settle for ugly shoes or basic styles. Many brick and mortar retailers are now carrying wide-width and larger size shoes. Online, the sky’s the limit! As always, once you find a brand that fits well, stick with it. Now hit the dance floor!